In Kung Fu Jungle (also released as Kung Fu Killer) Donnie Yen proves once again that less can be better in martial arts films. We have grown accustomed to special effects laden fighting, slow motion editing, super powered heroes on wires. Kung Fu Jungle forgoes most of that to present an old-fashioned “duel of the masters” action flick. I think it is the first action film I’ve watched in awhile that hasn’t relied upon high flying acrobatics and final showdowns involving the lone hero against a small army of thugs to make the point that our hero is the toughest man in the room. It appears to be director Teddy Chan’s homage to a simpler style of action film. 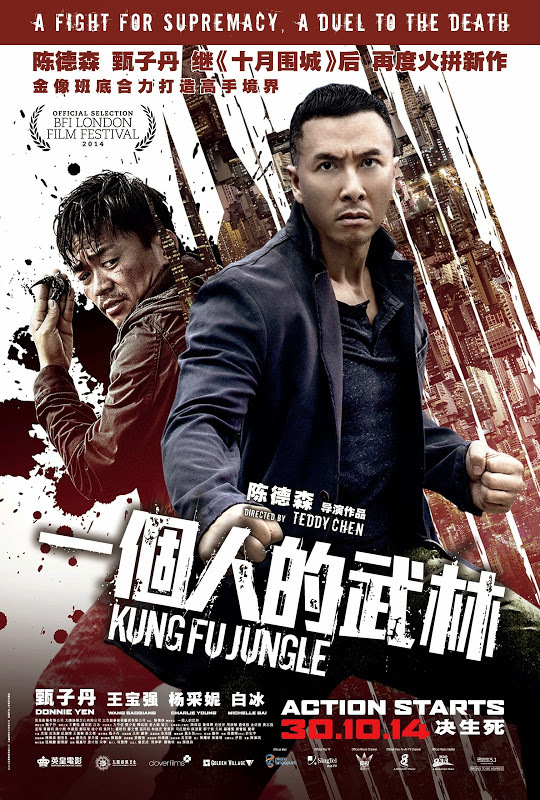 Kung Fu Jungle tells the story of a former police martial arts instructor (Yan) who has been released from prison to help a Hong Kong detective (Charlie Yeung) capture a serial killer named Fung Yu-Sau (Baoqiang Wang) who is holding a self-declared tournament to the death against past martial arts champions. It is largely a cat-chases-mouse police story that primarily exists to set up “matches” between masters and chase scenes involving the police, who always seem to just miss an opportunity to capture the villain. It is a fairly solid plot as far as martial arts action films go, but like most films in the genre, the fight choreography, not the plot, is what captures one’s attention. “Solid” is actually works as description for the film as a whole. There isn’t anything notably deficient about the story. Helmsman Chan and Cinematographer Wing-Hang Wong have shot the film in the modern “cool blue” palate, which is rather dull, but not unpleasant. The fighting is intense, but not shocking. There is a soundtrack, but I don’t remember much about it. Yan is fine as a hero who has come to value self-control while Wang is delightfully sinister in a role that calls for him believe that true martial arts is about killing and being number one. While I can sing the praises of the unobtrusive editing and special effects all I want, I have to admit that the film overall is “just right”, never boring, but produces nothing memorable until the final match between hero and villain on a freeway. That final duel, in which Yen and Wang face off against a stream of trucks and cars is the highlight of the film, which is what a climatic duel should be. The other memorable feature of the film, for fans of the genre at least, are the dozens of cameo appearances by character actors and stars of Hong Kong action films of the past forty years. For the followers of the classic and the obscure, the credits will come as a treat as Chan unveils the acting pedigrees of as many of supporting actors as he can. This entry was posted in Action, Foreign, Hong Kong, movie reviews and tagged 2014 movies, action film, Donnie Yen, hong kong movie, movie reviews. Bookmark the permalink.